It may be summer, but there’s still snow on the mountains, and you can bet Olympic skier Torin Koos is there to enjoy it! From June 18–22, skiers of all ages joined Torin on the slopes of Mt. Bachelor in Bend, Oregon to brush up on their skiing skills and have fun at Bend Camp. Bend Camp is a long-running tradition that invites Nordic skiers to train on snow and land with professional skiers. 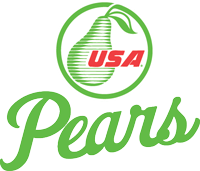 This year, skiers including Torin, Lars Flora, and Kristina Strandberg instructed campers, and Torin invited USA Pears to camp, too! As you can see, Perry was happy to join in the fun—he even made a new four-legged friend! It was a pear-fect start to the summer. This entry was posted in Torin Koos and tagged athlete, Torin Koos, travel by Brittany. Bookmark the permalink.